These are simple through-hole RJ45 sockets with PCB mounting posts. 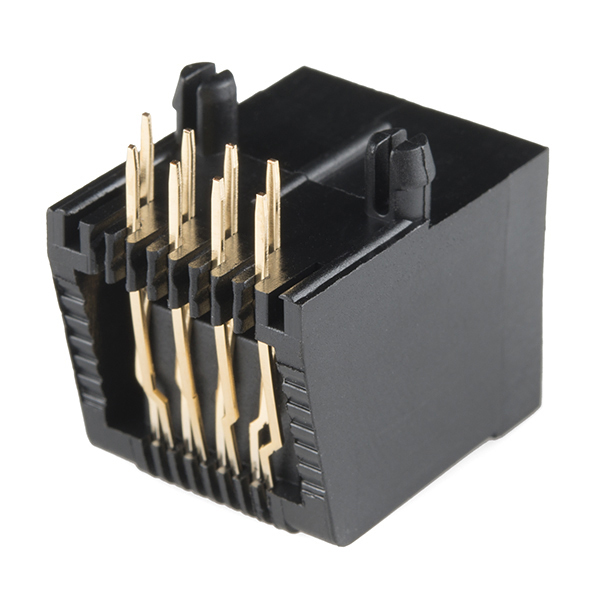 These 8-pin connectors are commonly used in conjunction with Cat5, Cat5e, and Cat6 Ethernet cables. Because Ethernet cable is so ubiquitous, these are awesome for projects where you need to string a lot of modules together over a distance. We used these, along with the breakout boards which you can find in the related items below, in the Sound Squid demo! Note: The price listed is for one jack. Is it time to go to the beer store? Seems I can never figure out how much beer is left in the keg. Time to let the IoT have a crack at this. It's quite easy to move the back row of conductors and align them one, .1" row behind the front row and attach them onto a standard pitch board. I've got one of these soldered into a ProtoScrewShield and it works great. You don't have much through pin on the backside to solder to but cutting off the plastic alignment pins and epoxying to the board provides plenty of physical strength. What's the difference between this and MagJack? The Magjack is more of a deluxe version of this. It has status LEDs, Metal housing, ect. It's nice to have these available without the isolating transformer. That way, you can use them to pass (low-current) DC power, TTL signaling, etc. Agreed. In the Magjack, there are pairs of pins that are connected through inductor coils ("shorts"). Trying to use those pins for TTL would not work. Magjack is for Ethernet communication only to my understanding. SFE Eagle Library says that the footprint is not tested. I can confirm that it works perfectly with this item. 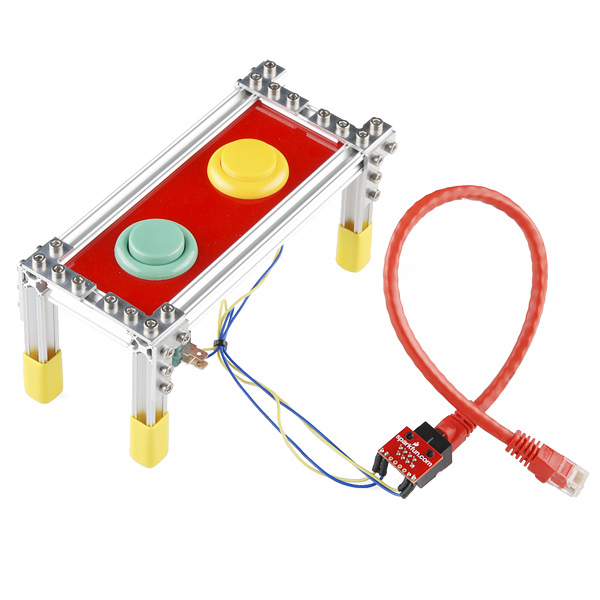 This item does not, but mated with the breakout board you can get it onto a breadboard. Is this connector rated for CAT 6? Do you have any specification on how much current this jack can carry? 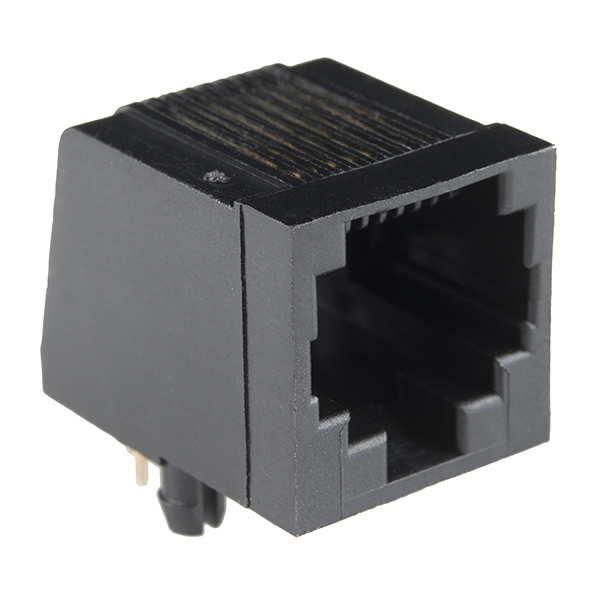 I need a vertical Ethernet jack (receptacle facing up, into the air). Do you think I'd be able to just bend the available pins 90 degrees and mount it onto my board that way? These don't seem to like to let go of Monoprice ethernet cables with "GIGA" stamped on the ends ("24 AWG Cat6 550 MHz UTP Bare Copper" kind) -- you have to put down a lot of pressure on the latch part with your thumb before the cable releases. I don't have this problem when I plug the cables into normal networking equipment. This part seems to work just fine with some other cables I have, though, so maybe it's more of a problem with the cable. RJHSE-5080-ND from digikey seems a lot better with those monoprice cables, but the footprint is different. It also doesn't appear to have a cat rating of any kind. That link to DigiKey refers to a Cat3 part, while SparkFun is Cat5 quality. Be sure to check, based upon your application. 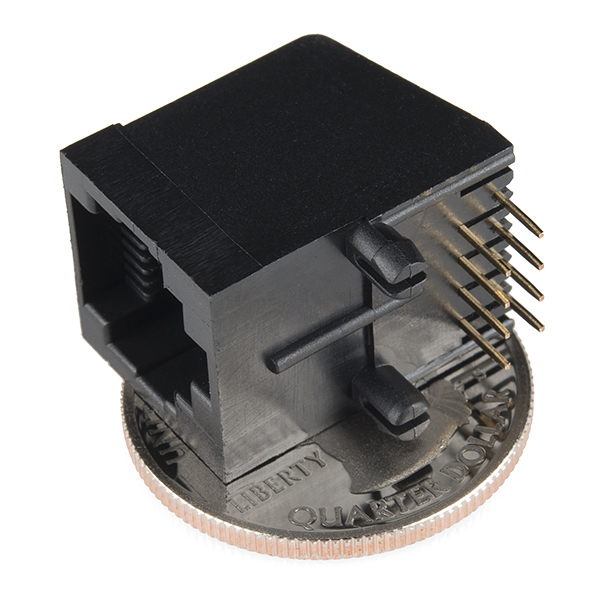 Since these aren't in stock anymore, what's the part number that I could buy on mouser so that your breakout board would still fit? I shouldn't have wasted a bunch of money buying these. They can be had for $0.35 at other online vendors. What manufacturer part number did you look for? The description says that it's an RJ15 socket...? I agree, the description needs updating. also, the picture shows two. can i assume the price is for one jack? Price is for one jack. Nice little connector, I used eight of them for one project which greatly cleaned up my cabeling from other unusual 10 pin connectors I had been using. A word of caution: I had to manually take all my own measurements and don't trust your PCB layout software footprints on existing RJ-45 parts either. Confirm your measurements, I had designed my whole board before these arrived and lost a week when I realized my footprint was way off.